The Eurovision Times KnockOut 2014 – “TEKO 2014“. You will be able to vote for your favourite in a knockout format (similar to the World Cup). Firstly there will be 13 heats. The act with the most votes in that heat qualifies directly for the 2nd round. 9 songs (the top 9 countries who finish 2nd and had the highest percentage of votes) will get a second chance. Due to an uneven number of participants Heats 12 and 13 only have 2 countries competing. In the 2nd round the remaining 2014 entries will compete in duels, through to quarter-finals and semi-finals until we will have 2 songs in the big final. Here you can see how this game works. Please check the front page of this blog for up-to-date information. In polls you will have about 3-4 days to vote for your favourite in each Heat or Duel. You may vote for your own country. You may vote in each Heat/Duel. One country from each heat will qualify for the second phase of Eurovision Knockout. 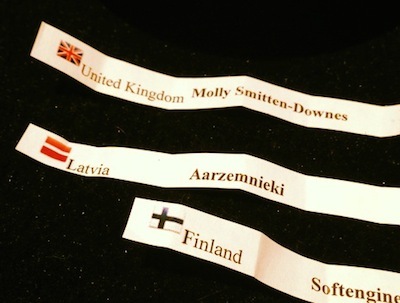 The countries have been allocated to one of the heats by random draw on March 21st, 2014 by the site editor. * =The countries which came second in their heat with the highest percentage. The Winners of the respective heats will compete in duels. The winner of each duel will proceed to the 3rd round.